If zebra and quagga mussels finally invade Montana waters, it will cost the state almost 40 times more than what it costs to keep them out. That was the conclusion of an economic impact study the Montana Invasive Species Council published Thursday, just two weeks in advance of a House Natural Resources hearing on how to renew state funding for invasive-mussel prevention. The study estimates that if invasive mussels become established in Montana, it would cost the state economy $234 million a year to offset or fight the damage to three economic sectors that face the greatest threat: recreation, infrastructure and irrigation. Of these, irrigation costs would be the greatest, running between $29 million and $60 million. The tourism sector would be out the most money, losing as much as $89 million a year. Zebra and quagga mussels are closely related dime-sized species from Asia that are feared because of their ability to rapidly multiply and encase many manmade structures, including agricultural and municipal water systems, boat hulls and propellers, and hydropower turbines. In addition, they can have a devastating effect on native aquatic species. Small as the mussels are, they’re capable of hitchhiking in boat crevices and ballast water, which is how they first arrived in the Great Lakes in the 1980s. Their microscopic larval form allows them to float with currents to invade elsewhere. It also makes them difficult to eradicate once they’re established. Many states, particularly those around the Great Lakes and Mississippi River, are strapped with the costly damage created by invasive mussels. That’s why Montana agencies responded with alarm in 2016 when mussels were detected in Tiber and Canyon Ferry reservoirs. Fortunately, it appears that unclean boats introduced just a few individuals so a population probably didn’t become established. But it was a wake-up call. The Columbia River Basin is the only basin that is still free of mussels and Idaho, Washington and Canada want to keep it that way. So after the scare, they urged Montana to take whatever steps were needed to keep those few mussels from moving into waters west of the Continental Divide. The 2017 Legislature hammered out an agreement to raise $13 million over the biennium with money from hydropower companies and fishing licenses. That was enough to fund two years of 50 check stations doing boat inspections around the state, especially at Tiber and Canyon Ferry. 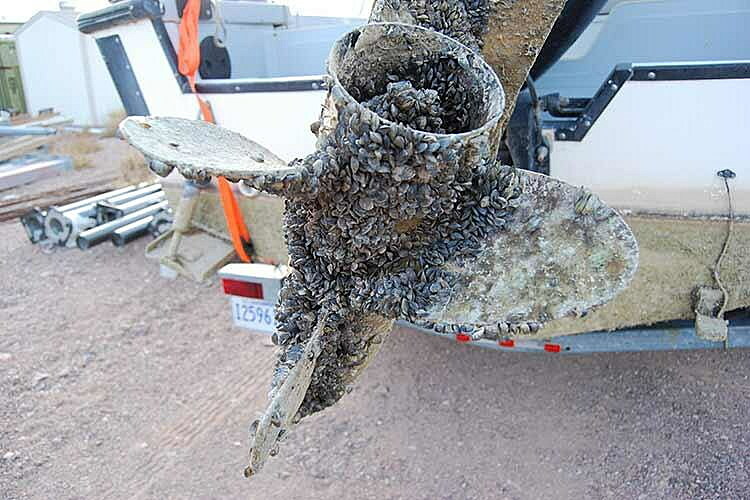 In 2018, more than 92,000 boats were inspected and 14 were found to be carrying mussels. The funding made a difference, but it was a hard-fought victory. Now legislators have to do it again to renew the $13 million worth of funding for the Aquatic Invasive Species program. Rep. Willis Curdy, D-Missoula, will try to do that when he presents House Bill 32 to the House Natural Resource committee on Feb. 4. The previous sponsor, Sen. Chas Vincent, R-Libby, warned him this summer that it wouldn’t be easy. The hydropower companies said they wouldn’t contribute to the fund this time, even though they have a lot to lose if mussels invade. The study found mussels could cost hydropower groups between $10 million and $25 million a year. So other options, such as boat registration fees, are being considered. According to a Legislative fiscal analysis, requiring all motorized and nonmotorized boats to buy a prevention pass could raise about $2.3 million a year. Continuing to assess a fishing license fee could raise another $1.9 million. To fill out the rest of the $6.5 million annual cost, HB 32 is proposing to get $2 million a year from the general fund. That’s where some legislators predict the fight will be. But those familiar with the devastation that mussels can cause want to remind legislators that $6.5 million is only about 3 percent of the $234 million cost that Montanans would potentially suffer.